The national capital territory, (NCT), of Delhi receives 611 mm of rainfall on an average annually and the number of rainy days are as low as 20-30. (A rainy day is specified as a day with more than or equal to 2.5 mm of rainfall). 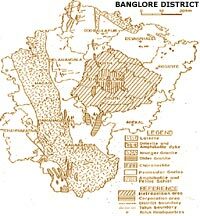 The geology of Delhi comprises Alwar quartzites and alluvium whose vertical hydraulic conductivity, (permeability), is high compared to the horizontal permeability. This makes the conditions favourable for artificial recharge.Thus most of the urban rainwater harvesting efforts revolve around recharge of aquifers which is the best option available taking into consideration the rainfall pattern and availability. According to a study conducted by the Centre for Symbiosis of Technology, Environment and Management (STEM), a Bangalore based research group, the demand supply gap is met by groundwater exploitation. It is estimated that 40 per cent of the population is dependent on groundwater, whereas the remaining part is pumped from the Cauvery river through a distance of 95 kilometres and a head of 1000 metres. Bangalore receives 970 mm rainfall annually and the number of rainy days is 59.8. Highest amount of rainfall is received during April to November, while the rest of the months receive scanty rainfall. Peak runoff is 50 millimeters per hour. Due to the availability of rainwater throughout the year, water is basically stored in these rainwater harvesting systems and used for non-potable purposes. Water from the rooftops is led into storage structures. First flushing is normally done by providing an extra length of pipe to collect the polluted 2.5 mm of rainfall. Filters are made of sponge and a mixture of sand, gravel and charcoal. After first flushing and filtration water is led into under ground sumps (which are very common in Bangalore) or to a new storage tank. The overflow from this tank is taken to an open well to recharge the aquifer.The geological formations are predominantly granite and granitic gneiss, with joints and fractures in abundance due to intense chemical weathering of rocks. The depth of weathering varies from 0.2 m to 20 m. This geological set-up offers an immense scope for recharging of ground aquifers. The undulating terrain with gentle slopes draining into lakes offer an ideal situation for water harvesting. In the urban area of Bangalore waterbodies cover about 5 per cent of land. A study made by the Centre for Ecological Studies and Indian Institute of Sciences revealed that out of 262 lakes in 1960 only 82 exist now of which less than 10 have water. The industrial unit of Escorts-Mahle-Goetze is located on a 20 hectare campus at Yelanka, a suburb of Bangalore. The total rainwater harvesting potential of the site is 185 million litres. A pilot project was set up in May 2000 covering about 1, 280 sq.m of roof area for the administrative block and the canteen building. With storage capacity of 42,00 litres, the unit collects about 1.05 million litres per year. The system is expected to pay back for itself in five years. The pilot system has received widespread publicity and is seen as a pioneering model for water harvesting by an industrial unit in Bangalore. The rooftop water harvesting is now being scaled up to cover 3000 sq.m of roof area. The commercial capital of the state of Madhya Pradesh has been facing acute shortage of drinking water. This is reflected in the wide gap in the demand and supply of 152 MLD drinking water in the city. 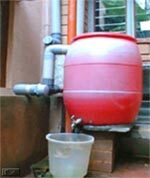 The ever-growing water demand made the administration think about rainwater harvesting. Practices in rainwater harvesting: Indore city is located on the basaltic lava flows of the Deccan Trap. Weathered/vesicular/fractured and jointed basalt form aquifers in the area. The average annual rainfall in this area is 930 mm and one-hour peak rainfall is 35 mm. Indore has got large areas of roofs and paved areas and hence a large quantum of runoff is produced from these areas during the rainy season. This runoff goes waste as overland flow and also creates problems of flooding in low-lying streets. In such a scenario, rooftop water harvesting provides the desired solution. Essentially aquifer recharging practices is being used. In order to motivate the public, Indore Municipal Corporation (IMC) has announced a rebate of 6 per cent on property tax for those who have implemented the rainwater harvesting work in their house/bungalow/building. To operate these activities three committees-technical, education and execution were formed by the IMC in which various experts of this field were involved. The various methods of groundwater recharge used are open wells, soak pit, recharge shaft/trench with and without injection well, lateral recharge shaft, injection wells and in big schemes suitable combination of the mentioned methods are employed. Pile: A commonly used technique in gardens, playgrounds and public places. A two-three m deep hole is mannually dug. The bottom one-third is filled with large (40-50 mm) pebbles, the middle portion with medium size (20 to 30 mm) pebbles and the upper one-third portion with sand (two-three mm). Permeable boxes of 1 cubic metre, filled with big size pebbles and brick pieces and lower portion with sand are provided at the top of the pile. Pix and link to soakaways. Swales: Swales are shallow, saucer like beds locally known as khantis. Making of swales do not in any way affect usual activities on the playground or on the road. Indore technique of water recharge: The technique essentially comprises diverting rainwater through trench or swale into silt trap tank. Water from the silt trap tank is allowed to pass through a sand filter (sand, medium and big size pebbles). A cement pipe of 300 mm diameter, fitted with wire net (10 mm mesh) has been fitted on the wall of wells through which rainwater get poured into the well. The city of Chennai faced a serious water crisis in the late 1980s. The need for effective groundwater management along with the management of surface runoff became a necessity. Moreover, extraction of groundwater started ringing alarm bells when groundwater in the north-western coastal belt indicated that there was a rapid ingress of seawater which extended from three kilometres inshore in 1969 to seven kilometres in 1983 and nine kilometres in 1987. Groundwater levels within the city also fell and brackish water began to appear even in localities which earlier had good quality groundwater sources. Practices in rainwater harvesting: Chennai receives an average annual rainfall of 1200 mm. It receives most of the rainfall from south-west and north-east monsoons. The geology of Chennai comprises mainly of clay, shale and sandstone (sand stone formation is the main water-bearing aquifer) Harvested rainwater is mostly used for recharging of aquifers, but in some places water is stored and used for non potable purposes. Normally a building is constructed in the centre of the plot and an open area is paved with concrete. The runoff from these areas is collected through structures like percolation pits, trenches and collection wells. Impacts: In the southern coastal aquifer area, the groundwater level in 1988 was around eight metres. A gain of 4.0 to 5.0 m was established in the 20 km stretch along the southern coast. In Anna Nagar, a significant difference was observed between areas where rainwater harvesting had been undertaken and where there were no such efforts. For the city as a whole, the average water level has increased from 6.8 m in 1987 to 4.55 m in 1998. To prevent the runoff from paved areas of the road, a kerb is made at the gate which diverts the water into a trench within the plot. This trench is 229 mm wide, constructed around the periphery of the plot. The depth varies from 114 mm near the gate and 457 mm in the rear. As the trench is sloped towards the rear of the plot the water gets filled in the trench. As the trench is filled with the water there will be a constant water head for the percolation bore pit. Any excess water from the trench overflows into the sandy bed at the corner of the building and percolates into the well. To enable the water collected to percolate and disperse back into the sub-soil, boreholes 254 mm in diameter and 5.56 m in depth are made at three metre intervals with collection chambers. The borehole is filled with broken bricks and sand. A collection chamber of size 457 mm x 457 mm x 457 mm size is provided on top which is filled with broken bricks and a silt arrester. For recharging the well, the rainwater pipe can be connected to the open well to divert the rainwater from the terrace into the well through rainwater downtake pipes. The rainwater falling around the open space surrounding the building can be diverted to the front gate where a gutter is provided for a depth of 457.2 mm and a width of 609 mm with perforated slabs. The rainwater collected in the gutter in front of the entrance is discharged into another recharge well of 914.4 mm diameter and 6.9 m depth, provided nearby through necessary piping arrangements. Water harvesting has been successfully used to address the issues of water scarcity and flooding caused by rainfall in the factory premises. A combination of recharge and storage was adopted at the site. A major rainwater pipe leads the rainwater from the roof to a gutter on both sides of the building. As the water comes through the roof, it is collected in a proposed storage well and then diverted into the existing service sump (of approximately 7,000 litre capacity). The overflow is taken to a percolation pit. Four rainwater harvesting percolation bore pits were proposed at the car park where water stagnates during rain. Total estimated cost of construction is around Rs. 75,000. Kuil Thottam, a slum settlement in Santhome, Chennai is meeting substantial part of its daily water requirements through rainwater harvesting. The rainwater harvesting technology adopted here as a 'model project' by Rotary Club of Madras Central and Jeyakumar incorporates a catchment area of approximately 1.85 m x 1.85 m on the terrace. The accumulated rainwater is diverted to a separate water pipe, which directs the flow into the filtration tank. The water then passes through the filtration tank and after decontamination, flows into a main tank. The stored water is being used for all domestic applications after chlorination and boiling. The tests done by Rotary Club of Madras Central and Chennai Metropolitan Water Supply and Sewage Board (CMWSSB) indicated that the quality of water was better than borewell or tap water. Based on the success of the 'Model Project', water harvesting was undertaken in a catchment area of 6 m x 6 m. Runoff is diverted to a filtration tank with a capcity of 200 litre and finally to a storage tank with a capacity of 3,000 litres capacity. Periodic chlorination is done to obtain bacteria free drinking water. The total cost of the water harvesting structure installed at Kuil Thottam is Rs. 100, 000 at the rate of Rs. 4,200 per tenement. R. Ramani, resident of Korattur has evolved various methods of water harvesting at his residence. Runoff from 100.0 sq.m of area is collected out of which rainwater from 50.0 sq. m is used for domestic purposes. Remaining quantity is used for gardening and to recharge groundwater recharging the well through a recharge pit and for watering the garden. He has resurfaced his roof with Mangalore terrace tiles to generate a mild slope to the lentil level storage tank with a capacity of about 3,000 litres. To keep this tank free from microbial contamination he has mixed a waterproofing chemical with the cement slurry to give an acrylic-poly-sulphate cement slurry coating. Through simple treatment and later filtering through 'Aqua -Guards' a commercially available water purifying product that kill germs, the rainwater is used for drinking and kitchen purposes. Each filling of the tank can sustain the drinking and kitchen needs for about 2 months. In a year the tank gets filled four to five times. Sometimes, the tank gets filled up more than once in a week. During these times, the excess water is diverted to recharge the groundwater aquifer. Ramani had to invest Rs. 8,000.00 in this project which was implemented in 1994. In order to facilitate groundwater management, the Chennai Metropolitan Area Groundwater (Regulation) Act was passed in 1987. Metrowater was identified as the enforcing authority for multistoried buildings/special buildings. They issued instructions that no new water connection be given unless water harvesting structures provided in the approved plan were implemented. A series of investments were made by Chennai Metrowater from 1991 onwards to harvest floodwaters along the course of the rivers bordering the city. Three checkdams were constructed at Valliyur, Jagnathapuram and Melsembedu in 1991, 1992 and 1995 respectively. Moreover the government agencies are involved in implementing rainwater harvesting structures in public places like parks, roads, fly overs, and storm drains. Thus every possible catchment is being utilised for water harvesting. As of now 400 buildings, 216 schools and 56 parks owned by the corporation of Chennai has the rainwater harvesting systems installed in it. TWAD Board has taken steps to implement the rain water harvesting structures in TWAD board building with a rooftop area of 2000 sqm. The calculated water harvesting potential of this building is 14.4 lakh litres, which is expected to serve water supply for 144 days for the staff and visitors. There are about 12 rainwater pipes are drained out through 3 recharge trenches and a recharge well. The recharge trench is 10 m in length, 1.0 m wide and 2.0 m deep. The bottom of the trench is filled with 60 cm of pebbles followed by coarse sand upto 1.20 m. Three unlined recharge bores of 150 mm diameter are drilled inside the trench each to a depth of 4.0 m feet and filled up with pebbles. Three of the rainwater pipes are connected to each trench. The water supply system in the capital of Mizoram, originally designed in 1988 for 80,000 people, is now catering to the needs of over 150,000 residents, making it grossly inadequate. Due to inadequate and unreliable water supply people are resorting to rooftop water harvesting the most convenient and economical water supply system. 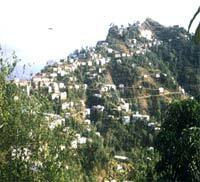 Mizoram receives an average rainfall of 2,500 mm annually and is distributed through out the year. The major advantage is that most of the buildings are constructed with sloping roofs that use corrugated galvanised iron(CGI) sheets which are conducive to rainwater harvesting. Even today, most buildings in Aizwal are constructed with sloping roofs that use corrugated galvanised iron sheets, rain gutters either of PVC pipes or bamboo is used to drain water into the storage tank and cylindrical storage tanks with galvanised iron semi-circular rain gutters to catch rainwater. (Figure 13 and 14). Gradually, reinforced cement concrete (RCC), ferrocement and plastic tanks are being introduced. Tanks of 10,000 litres capacity is commonly used. 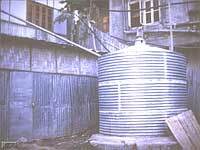 At present, Aizawl has more than 10,000 rainwater harvesting tanks in individual houses which have been constructed by the residents at their own expense or with state government assistance. In a pollution-free state like Mizoram where major industries are yet to come, rainwater is free from undesirable chemicals and is of potable quality.